In partnership with Public Services International (PSI), a global trade union federation representing 20 million workers who deliver public services in more than 160 countries. 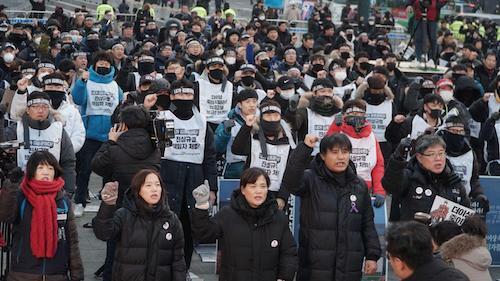 The KPTU announced on 5 February that the South Korean government announced measures in response to the industrial death of Kim Yong-gyun, a 24-year-old power plant worker, killed 58 days ago in a tragic accident resulting from the outsourcing of danger and lack of safety measures at Taean Power Plant. Korea Western Power Co. and Korea Engineering & Power Service, the subcontractor that Kim was employed for have agreed to abide by the government's measures and in particular to cooperate with the special investigation into root causes. They have also agreed to compensation measures and to ensure sufficient time off and a safe work environment for Kim's co-workers. More details coming soon.